Fort Collins Video is owned and operated by Larry Chapman. He will be your initial contact and runs the show. That does not mean we can't handle large and complex video projects! We have a network of trusted partners that we call on regularly to help with extra cameras, lighting, sound, etc. The Colorado Professional Videographers Association is a primary source of these partners. Winner of the 2008 Outstanding Dedication award from the Colorado Professional Videographers Association. Back in Junior High when most of us were just trying to remember our locker combination, Larry Chapman, founder of Fort Collins Video, was busy making movies with his Dad's wind-up 8mm movie camera - a camera that still sits proudly in his studio alongside his modern collection of digital video equipment. 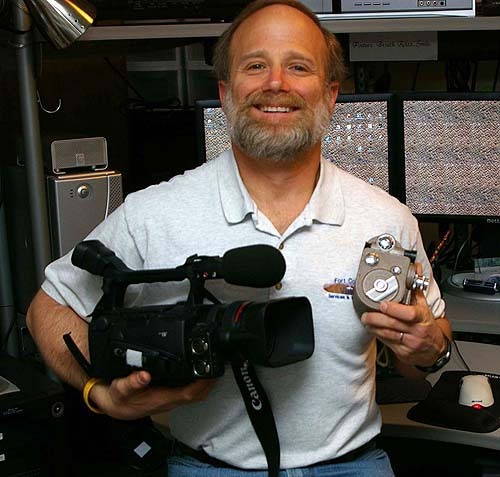 Twenty-seven years in engineering and management at HP, all while nurturing his true love of both still photography and video, led Larry to the creation of his first full length DVD, "Longs Peak - The Mountain and Your Journeys" in 2002 (2nd Edition released in 2007). The success of this project prompted Larry, with the support of his wife of 39 years and his daughter, to make the leap of faith and dedicate himself to serving northern Colorado's increasing needs for high-quality video. A Colorado native, Larry personifies the adventurer we all dream of being. From climbing all 54 Colorado 14ers, to racing over 50 Triathlons (including an Ironman), several ultra-marathons (including two 50-mile mountain races), 480 skydives, and becoming a Certified Scuba Diver. Larry will bring his passion and dedication, as well as his years of experience, to create a truly unique product for you! Still not convinced? Read what some of Fort Collins Video's clients have to say in their testimonials! We accept cash, American Express, Visa, MasterCard, Discover, PayPal and, on a case-by-case basis, checks. By using PayPal you can also pay with most credit cards not taken directly by us.